How can you ensure that your sport organization is recruiting and selecting players in a values-based and principle-driven way? 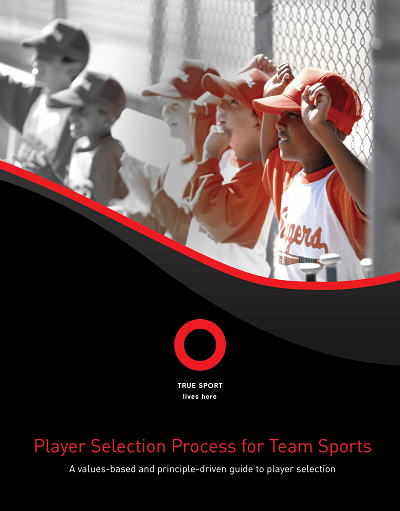 The Player Selection Process is a values-based and principle-driven guide and approach to player selection that is designed to help sport organizations ensure transparency and fairness as well as communicate their commitment to True Sport. Assisting coaches in providing athletes with the best possible sport experience, this guide helps to identify the most appropriate level of play for individuals in an environment where they can grow as athletes and as people. We’ve made it easy for sport organizations and coaches to customize this guide. Simply click download, and fill in the information you see <between the angled brackets>. True Sport wishes to acknowledge and thank the following individuals for their significant contributions toward the development of this resource. Greg Clarke – Director, Private Client Group, HollisWealth® Insurance Agency Ltd.
Rick Julien – Vice President, Almar Roofing LTD. Questions regarding this resource may be directed to: info@truesport.ca.